The day after a very successful ride was never going to be easy, it turns out I still managed to bag 60 miles. I did not need to, the distance between where I was this morning and where I need to be tomorrow night was roughly 75 miles. It would have been easier to split the thing in two perhaps. That is what I would have done in July but as we are in November and, while the forecast for today was dry the one for tomorrow is not, I thought, better put the miles in when it’s dry. The whole day was overcast and gave a strange luminescence to all the pictures I took. Driftwood benches and the sea. 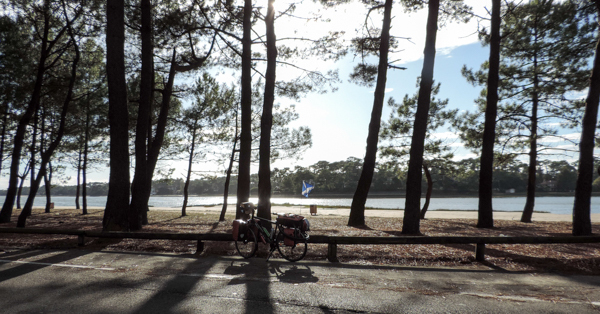 The camera worked all of the time, which was a novelty, and I spent the day between views of the Atlantic coast and cycle paths just inside the costal forests. Like in Italy these forest are owned by the government. Unlike in Italy they are well developed which has both positive and negative aspects. On the negative there is definitely the planting. They could try not to replant the trees in straight lines, I know it does not do anything for the growth quality but it would do wonder for the sense of originality of the whole thing. So, this is how you do cycle lanes. On the positive side there are amazing cycle lanes, with tarmac and road signs. We, in the UK, are normally quite dismissive of the positive effect the European Union has on the land we live in. 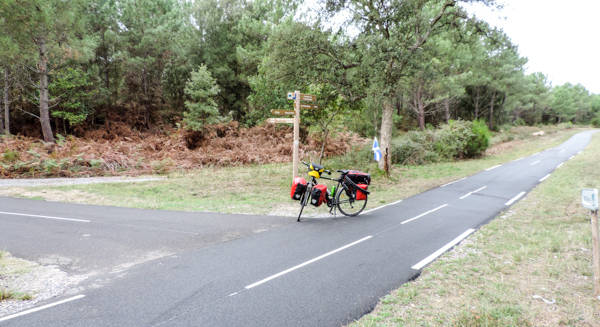 I think some, if not all of these path are part of a European cycling route network partly funded by EU money. There even are latitude and longitude references on the SOS badge. 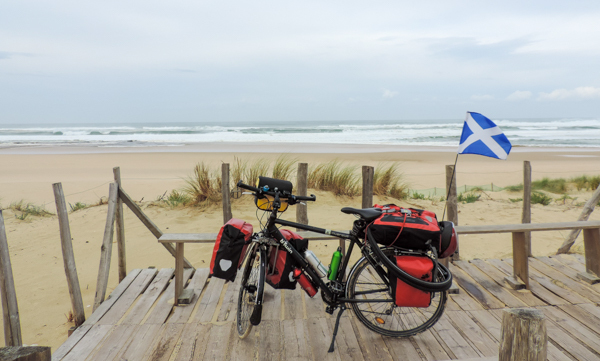 Anyway after forty miles of this it was on the road with cars again and going through Capbreton which, I must say, impressed me much. I would compare it to Forte dei Marmi in Tuscany. It looked tidy and manicured, with nice people that even offered to take pictures of me and they spoke english. I made a stop at the port and got myself a big ice cream, by then the night accommodation was booked and it was just the case of rolling towards it when I had enough of the sun and ice cream by the port. Tomorrow might not be raining as hard as I expected from yesterday weather forecast, it will however do so and I have lost my rain protector so I might get to Lorenzo’s a bit wet. I am sure they can lend me a towel. Non ti strapazzare troppo e prenditi il riposo che ti serve. Se ti coglie la brutta stagione lungo il cammino puoi sempre prendere un treno.E’ ancora tanta la strada che ti aspetta.